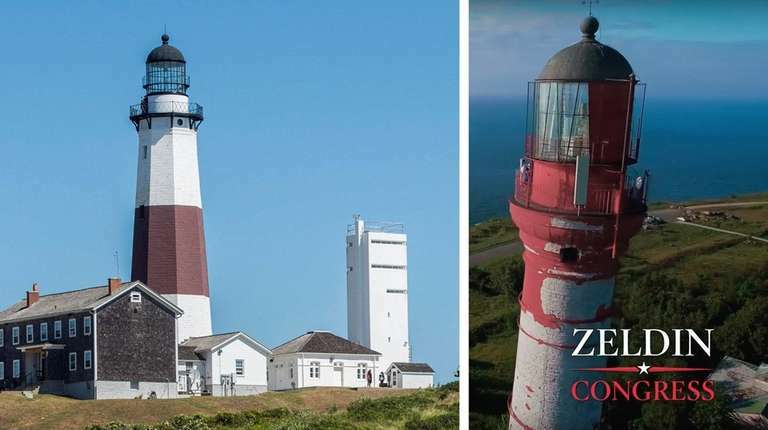 The Montauk Lighthouse as seen in 2015 next to an image of the Pakri Lighthouse in Estonia shown in Lee Zeldin’s online ad for re-election. Photo Credit: Gordon M. Grant; Zeldin for Congress via YouTube. Rep. Lee Zeldin seemed to have a good time visiting the historic Montauk Lighthouse in his Long Island congressional district in 2016 – but he should have paid closer attention. His latest campaign commercial features some beautiful footage of a lighthouse that vaguely resembles the Montauk icon, but is actually the Pakri Lighthouse, 4,000 miles away in Estonia. Zeldin’s campaign has posted two versions of the ad online, a 30-second cut and a 15-second cut that has more than 2,500 views on Youtube. Zeldin campaign spokesman Chris Boyle told City & State that the ad currently airing on TV has been fixed, and sent a version of the ad with the correct lighthouse. But as of Thursday afternoon, only the ad with the Estonian lighthouse was available on Zeldin’s Youtube page. Zeldin likes to claim that he is the “only Long Islander in this race”…. Maybe he is the “only Estonian in this race.” He needs a lesson on the Lighthouses of Suffolk County. Want to teach that lesson, Perry? While Lee Zeldin is busy dodging the voters, avoiding candidate forums until two weeks before the election, and calling me names, he should really come to better grips with our local geography. I live in the Town of East Hampton, full-time. I built my home in 1999 and proudly have been a taxpayer since. Our most famous town landmark is the Montauk Lighthouse. It is historic and known not just here but internationally. So I was puzzled to see Lee’s first TV commercial featuring a photo of a lighthouse in Estonia, Northern Europe, as Lee discusses drilling off Long Island’s coast. Before you start talking about my Long Island residence, perhaps it would be better to study our local landmarks and learn the difference between Montauk and Estonia. And by the way, if you oppose offshore drilling, why wouldn’t you sign the Congressional letter to Interior Secretary Zinke opposing drilling along the East Coast? Your signature’s absence was notable for a representative from New York. This entry was posted in Uncategorized, Zeldin and tagged estonia, lighthouse, montauk. Bookmark the permalink. Good David. Glad you put this up. Estonia !